Sharpen your baseball skills with some of America’s finest players from the best college programs in the country. Clinic attendees will have opportunities to work on hitting, base running, infield/​outfield play, as well as pitching and catching. Attendees will also participate in “Commodores Chat” where coaches and players discuss topics like Sportsmanship, Academics, Teamwork and other issues important to being an all around player. 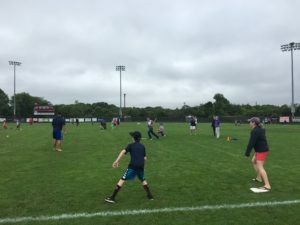 Players from great college programs like Kansas, Florida State, Texas A&M, TCU, Rice and others will work in a small player­-​to-​­coach ratio at Guv Fuller Field. Clinics are offered Tuesday – Friday from 9:00 a.m. – 11:30 a.m. June 25th (Session 1) through August 1st (end of Session 6). Elite Clinic: Boys and girls ages 11–14 are welcome (kids aged 10 or 15 may participate with permission … email Linda Peters @ lpeters.fc@gmail.com). The Elite Clinic is intended for kids who have significant experience in baseball through AAU Leagues, Little League, or similar. The focus will be on attaining advanced skills. The cost per 4-​day session is $165. Private lessons can be arranged by contacting Coach Landry during clinics. Disclaimer: By registering for the Commodores Baseball Clinic, Parents/​Guardians assume all risks and hazards, incidental to such participation, including transportation to and from activities; and do hereby waive, release, absolve, indemnify, and agree to hold harmless the organizers, sponsors, supervisors, staff, and participants from any claim arising out of any injury to his/​her child, whether the result of negligence or any other cause. NOTE: Unfortunately we can’t control Mother Nature and no refunds will be given for weather since it is out of our control. Make up days will be offered during future sessions during the summer, if space is available.